Measurement techniques: Infrared Reflection, Magnetic Search Coil, and High-Speed Digital Video Systems to record eye movements in the horizontal, vertical and torsional planes of humans; Motion Platform and Rotating Chairs to study balance. 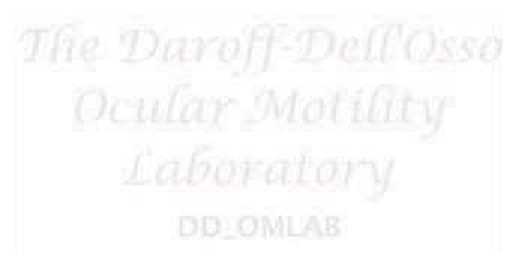 Off-Site Research: Because the Daroff-Dell'Osso Ocular Motility Laboratory is designed for the study of human eye movements only, any non-human studies, e.g., on canines [COMLAB] and mice, have been carried out by specific investigators at other facilities in collaboration with investigators based at those facilities. UPDATES New OMtools [02 Feb 2019] OMtools has undergone major renovation and testing in 2018, and is now available. It has been thoroughly modernized to work with recent MATLAB versions, and is easier to install and configure than before. It can now import Eyelink EDF files (with free download of SR-Research's developer kit for Mac, Linux, or Windows). New DD_OMLAB Dissertations Now abvailable are downloadable PDF's of the PhD Dissertations of LF Dell'Osso, JB Jacobs, and ZI Wang. These contain the first OMS models to simulate normal function and both INS and FMNS.